The Narrative has been full of Appfolio this April! The company, headquartered in Goleta, hosted two workshops for their employees in the past week. Appfolio owns and operates two softwares, Appfolio Inc. and Mycase, both very influential to the property management and legal communities. With a growing company with such successful products, these workshops were hosted to enhance and strengthen their teams. Appfolio started off with a bang! The first workshop, for the property management software sector, incorporated a cross-functional team with all different parts of the business coming together to align their selves for one goal. With a large company with many facets, not all the employees have met before so this workshop served as the first time meeting for some! Representatives from marketing, sales, implementation, training, customer service, engineering,design and product management all came together for this special event. The group talked through everyone's positions and made sure each person was up to speed on everyone's role in and contribution to the company. As a team, they worked backwards for who they are solving problems for with their software and getting a mutual understanding of their pains. 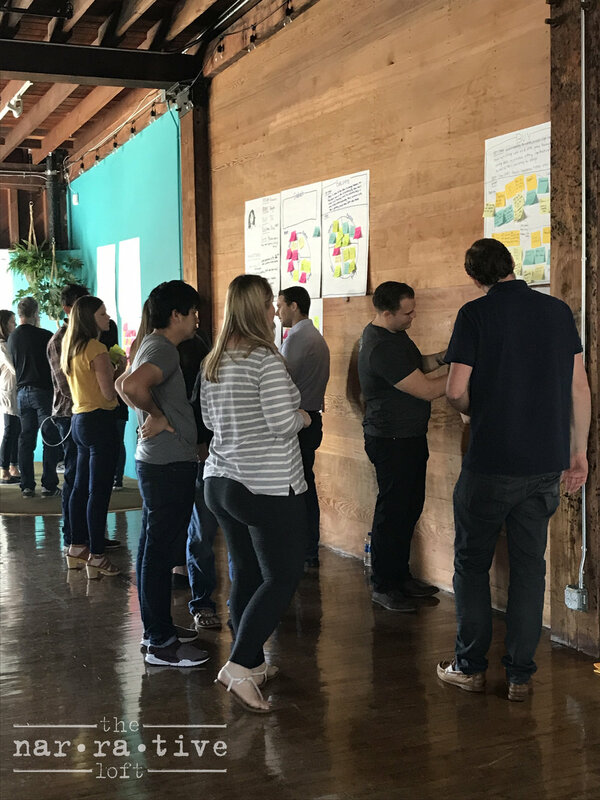 The workshop doubled as both empathy and brainstorming and left the group aligned and with a much greater understanding of each other's roles and how to best serve their clients. Thanks to Justin Davis for putting on this incredible event! After a large group event, Appfolio held a more intimate workshop for round two. The Vice President of Engineering and the engineering directors for Appfolio's property management software met to brainstorm ways to improve their current system. The team met at The Narrative and spent the morning reading Geoff Smart and Randy Street's book, Who. As a team, they analyzed the content and determined what tactics in the book applies directly to them and how they can incorporate them into their current systems to improve their foundation. The creative juices were flowing and the team came out with some great innovations! Thanks for some April fun, Appfolio! Come back soon! Discussing the ideas in Who.